My son has these books written by Laura Numeroff and one of them is called "If You Give a Moose a Muffin." It's such a sweet and silly story about a boy who gives a moose a muffin and the adventures that ensue. We have so much fun reading it and I always kept it in the back of my mind that someday I will come up with an awesome egg-free muffin for him. *I recommend wild blueberries. They're smaller but more flavorful. You can find frozen organic blueberries in the freezer section of most grocery stores or supermarkets. Preheat oven to 375 degrees F. Line muffin pan with paper liners. Sift together flour, sugar, baking powder and salt. Mix together butter, milk, yogurt and vanilla extract in a small mixing bowl. Pour into the dry mixture and mix till combined. Gently fold in the blueberries. Using an ice cream scooper, divide the batter equally into the muffin pan. Bake for 20 to 25 minutes or until golden brown. I love that book! It was one of my favourites as a kid, along with Chicka Chicka Boom Boom, Cloudy with a Chance of Meatballs (unsure whether to see the movie...) and Drac and the Gremlin. 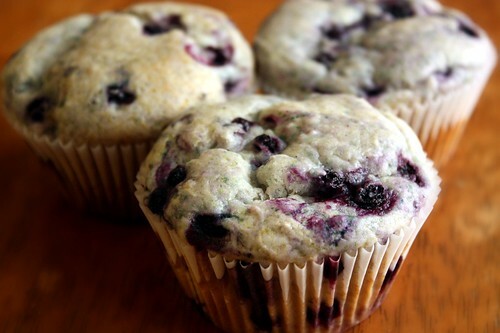 Love this egg-free muffin recipe! Your blog is great with all the nut-free, egg-free and soy-free recipes. Well done! I found your blog and love your recipes! I have launched an online store dedicated to providing resources and products to people suffering with Food Allergies, Food Intolerance and those requiring other special diets. One of those resources is giving my customers some great recipes to try…and in the process, promoting cookbook authors/bloggers. If you are interested in participating, I provide direct reference to your blog and also include a link back to your website. I can pull your entries directly from your site. I add them individually with social media mentions as well. Additionally, I feature an author each month in my newsletters. I am a Mom to 3 kids that love to help in the kitchen but I also have a severe allergy to eggs. As a result we have really struggled to find recipes that work well without eggs but are simple enough for my kids to try and that they will actually eat at the end! 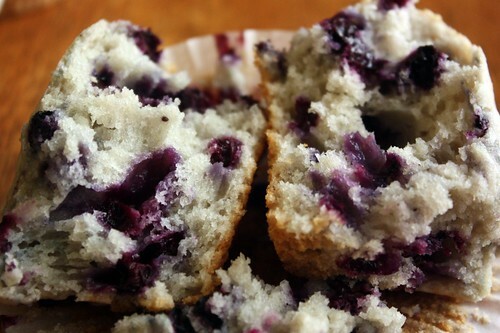 Well, I am delighted to say that my daughter & I successfully made a batch of these blueberry muffins today and two thirds of them have already been devoured - we're trying to save at least one for Dad!! Thank you so much for sharing your recipes, we're going to try the crazy delicious cookies next! Thank you for the recipe. I didn't have blueberry yogurt so I used light and fit vanilla yogurt and put in more blueberries. I really like them. I also tried some of the batter with chocolate chips instead of blueberries, this will please some of the little ones in my home. Thank you for an easy and delicious recipe, it is difficult to find good baking recipes that don't have eggs. Delicious! Thanks! My son is allergic to eggs and these are probably the best muffins I have made for him. I have tried other recipes which were good...but these are a keeper! Mmmm, amazing muffins! The yogurt makes them so moist and adds some extra flavor! Thanks so much for a great recipe! I made these with gluten free flour (Kinnickinnick brand)& plain yogurt & they are still quite tasty - even my gluten and egg eating friends found them good. Thanks! I made this receipe today but I didn't have all of the right ingredients, so I substituted with frozen wild berries and strawberry yogurt.... They were AMAZING! Thank you! My son is allergic to eggs and one thing he misses the most are muffins! Where can I find blueberry yogurt in UK?I don't see any in stores-I will try making these with plain yogurt instead.Thank you for sharing some good recipes. I love these muffins! I originally made them for my daughter (allergic to egg), but everyone else loved them so much that I've made them many more times. Thank you for your wonderful blog! These muffins are fabulous! My son is allergic to eggs and I struggle to find baked goods recipes that the rest of the family likes. This is a keeper. My family and I thank you! We've made these quite a few times now and LOVE them! I've always had berries of some kind to use but this time I don't.